Beer options behind security at PDX have improved dramatically in the last few months. I was out there this weekend on my way to a Vegas wedding, and was happy to find that Rogue and Laurelwood have each recently opened new pubs at the airport. They both have a decent selection of their own beers, and a second, larger Laurelwood pub opening next week will bring the joy closer to more airline gates. The good news is that they always have one of the "John's Locker Stock" bruisers on tap. They sold me a 12 ounce goblet of Charlie for $5, which is kind of nutty since I think the 16 ounce pints of everything else go for the more typical airport price of $6.25 (or $7.25 if you super-size it to 22 ounces). They have one more rotating tap, this weekend it was the Honey Orange Wheat from their Eugene brewery. Puzzlingly, they also serve Bud and Bud Light. 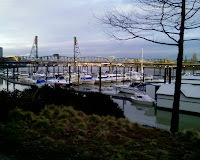 Willamette is so new that I think I've only seen them at the Green Dragon. It's always good to see a new Hopworks tap spring up, and Double Mountain is a truly inspired choice, one of the best new breweries in the area. Nice to see Amnesia there, too. So, no matter which side of the security cordon you're on at PDX, you won't have to compromise on quality to be able to fortify yourself for the outward journey or wind down after the return trip. 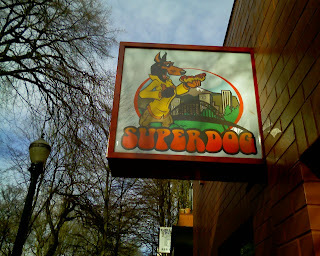 The new pubs also give out-of-towners a little better taste of Portland beer culture than they got before. It's a very positive development for the airport. 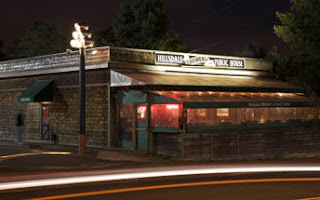 A bunch of the Pub Nighters turned out Saturday to the McMenamins' Hillsdale Pub (photo lifted from McMenamins' website) to cheer on our local boy, Corey Blodgett, in the Battle of the Belt. The Battle of the Belt is an internal competition to decide which brewer will represent McMenamins' at the Oregon Brewers' Festival. Corey is local in the sense that he lives in the neighborhood and runs with the Pub Night crowd, but the Cornelius Pass Roadhouse where he brews is so far from my stomping grounds that I rarely get any of his beers. 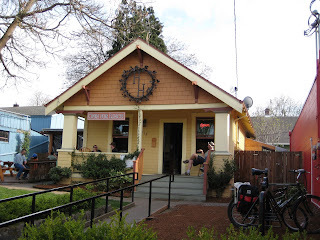 One saving grace is that the CPR's tied house in town is the McMenamins' on Broadway, not that far away. But they don't always get his very coolest beers, like the oak-aged Double Red Ale that I got to try over the weekend, thanks to Brett, who snagged me a taste from the roadhouse. The Double Red was very nice, compares really well to Ninkasi's Believer. I like that style a lot. Every year, there's been some conflict that kept me from going to the Battle of the Belt. So I was very happy this year that Carla and I got to hitch a ride with Dave and Jill and little baby Vaughn and cast a vote for Corey, not to mention actually taste some of his beer. Corey and fellow CPR brewer Chris Oslin's entry was "Rose City 'Til I DiePA" -- maybe work on those beer names, guys -- which was a delicious IIPA made with organic malt. Just one kind of malt, does that make it a single malt? Consulting my notes here... "awesome IPA". Well, that's my usual way with words for these things. I can expand a little by saying that it was very well-balanced, hoppy without getting too bitter. Smooth and strong. You get to vote on three beers at the battle, and my other two votes went to High Street's Schneeflocken (notes: Belgian tripley, good), and Lighthouse ORator (notes: bourbony, good). Hmmm, looking back over the program, those are strange comments on those beers, since the ORator doppelbock didn't have anything to do with bourbon, and the Schneeflocken was a Dunkel Weisse, more Alpine than Low Country. Harry Sanger was the brewer of the ORator and Lane Fricke was the Schneeflocken brewer. The name "Pale Rider" brings back old Austin memories. Celis briefly made a Pale Rider Ale in collaboration with Clint Eastwood, with proceeds donated to charity. Hilarious advertising slogan: "You didn't expect Clint Eastwood to make a salad dressing, did you?". The Dad Watson's definitely has a 2008 Northwest flavor instead of a 1998 Texas one. Another highlight was meeting Corey's dad Walt, who flew in from Milwaukee for the festivities. For whatever reason, the winner of the Battle of the Belt won't be announced for a few more days. A good time was had by all, and I hope to make it back next year. Update [2008/02/25]: McMenamins' finally announced the winners: Hillsdale 1st place, CPR 2nd place, Fulton 3rd place. Sounds like a home-field advantage to me, but there's no denying that the three winners were excellent ales. Congratulations to the brewers! When I conceived my prank, it came with a good blog-post title: "Nobody Wants My Collectible Bottle". But then someone out-pranked me and actually bid on the empty bottle of Abyss that I listed on Ebay for $15 plus $10 shipping and handling. The item is not available at any retail outlet, and the container has a value that substantially exceeds the current retail price of the alcohol in the container. There's no way you could believe that was true, especially since the Ebay sellers all proclaim the excellence of the top-ranked Imperial Stout in their descriptions of the bottles for sale. It's a measure of the malaise we've fallen into, that people will tell any lie for convenience, no matter how obviously false it is. As a beer fan, I'm annoyed by beer scalping; you can understand why brewer Tomme Arthur takes it more personally when someone says his beer is worth less than its bottle and is not intended for consumption. You are bidding on an EMPTY bottle!!! Since Ebay does not permit the sale of alcoholic beverages, I drank the contents of this collectible 2007 Abyss bottle before listing it for auction. If you win the auction, I will ship you the empty collectible bottle, plus the collectible wax-covered bottlecap, plus a couple bits of collectible wax that broke off when I removed the bottlecap. Other collectible Abyss bottles have sold this year for as much as $45 apiece!!! Of course, those were unopened collectible bottles that contained an alcoholic beverage. When you buy this EMPTY collectible Abyss bottle, you can buy with the confidence that you're buying from someone who plays by the rules, and you get the satisfaction of knowing how much I enjoyed drinking this delicious Imperial Stout. A: Good point. I just put what Ebay said UPS ground would cost. I'll negotiate something reasonable with the winner. A: Oh, I drank every single drop. Even when the bottle looked empty, I laid down with it on the couch for a couple of hours to make sure every bit went into my mouth. Q: Hi there, I was wondering if you could post a picture of the wax shards. Are all shards still intact or are a few missing? What is the condition of the bottle cap? Did you use a quarter on top while prying it off it ensure it stays in M10+ condition? A: I understand your concern, since the wax on this bottle was rated the best bottle wax in the world by the Men's Journal. I tried to preserve it all, but there could be some missing molecules. Sadly, I didn't do the quarter trick when opening the bottle. I was in a big hurry to pour myself a glass. So I can't guarantee the excellence of the bottlecap. Then, horror of horrors, someone actually bid on it. Now I really have to rinse the bottle out, and find a box, and, and -- please, no! -- go to the post office and mail it! My interest was piqued a little to see that the bidder's Ebay ID was "ftommearthur". Wow! It looks like Tomme Arthur liked my little joke and decided to throw some fuel on the fire. Hey, maybe instead of cash, he'll pay me with some "incidental liquids" from his brewery. But what's the "F" for? Is his legal name F. Tomme Arthur? Or is this someone else, the Female Tomme Arthur perhaps? Ah, probably someone just pranking me back -- with no intention of paying -- and yanking Tomme's chain at the same time. Luckily, I had been careful to safely stash away the promised bottlecap and bits of wax, otherwise I'd have to drink another bottle of incidental non-collectible stout. I don't think I'm cut out for this Ebay thing. UPS charged me $13.59 for shipping (including $2.70 "Rural Surcharge", for the Vermont end), and Ebay invoiced me $1.39. My laziness caused me to pay another $5.65 to UPS to pack it all up for me. Suddenly $15 + $10 shipping looks like quite a bargain! There go my hopes for getting rich by drinking beer... unless... maybe someone wants to buy a set of 3 collectible bottles. Empty, of course. Going through a bunch of paperwork and mail that had piled up on my desk for a year or so, I found the program from 2007's Barleywine and Big Beer Fest at the Lucky Lab. Actually the program calls it a "Tastival". Let's hope people stop using that word this year. I wasn't blogging at the time, but I scribbled my usual short and incoherent notes on the program. It's alarming how many of these huge beers I claim to have tasted -- we must have been sharing sips around the table, which I think consisted of Lindsey, Corey, Brett, and me. Lucky Lab: 2002 Old Yeller: Textbook. Nice. Lucky Lab: 2004 Old Yeller: Better. Coffee/Chocolate. Terminal Gravity: 2005 Barleywine: Best so far. Oops, Lucky Lab better. Rogue: 2004 Old Crustacean: Good stuff. Hops & brown sugar. Anderson Valley: 2006 Beer of the Horn: Yes. But very sweet. Sierra Nevada: 2004 Bigfoot: Nice hoppy. Sierra Nevada: 2005 Bigfoot: Ditto. Tuck's: 2005 Glutius Maximus Barleywine: Good. Caldera: 2003 Russian Imperial Stout: Good times. Caldera: 2005 Russian Imperial Stout: Better times. Spiced. Lagunitas: 2005 Brown Shugga: Better than fresh. Pelican: 2006 Grand Cru: Very nice. Dark color. Tasty. Mmmm... Caldera. As we were sipping Abyss last week, Dave and I were reminiscing about Caldera Imperial Stout. 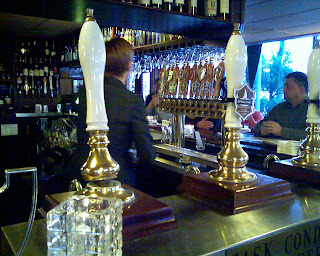 Sometime in 2004 we discovered that delicious thing on tap at William's on 12th, a bistro in the neighborhood that has since closed down. It was the first I'd heard of Caldera, but what a great way to get introduced. The imperial stout was so delicious, pitch black, with a big, dark head. Anyway, the other day we were trying to remember how well it would compare with Abyss -- pretty well, I suspect. A couple years of it are on the list for this year's Festival, I can't wait to refresh my memory. 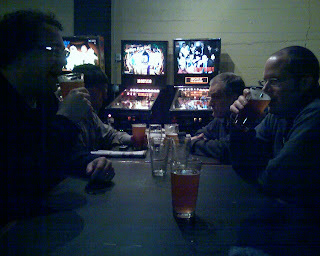 Since I had some free time this evening, I decided to participate in The Session, which is a kind of synchronized blogging where a bunch of beer bloggers write on the same subject. This month's topic is barleywines, so naturally I strolled down to the Lucky Labrador for a sample of Old Yeller. When Carla and I were first married, she sometimes made fun of my habit of sleeping with a pillow between my legs. (It's good for your back.) Her enjoyment only increased when she discovered that it wasn't just any pillow that I needed, but the same old dilapidated pillow every night. At some point that pillow had a yellow pillowcase on it that didn't match any of the rest of our linen, and she began to taunt me: "Where's Old Yeller? I haven't seen Old Yeller tonight." So I would have a soft spot for the Lucky Lab's barleywine just because of the name, even if it wasn't so delicious. This really is a masterful beer, one of their best. Like most barleywines, you get plenty of the strong alcohol bite. Also true to form, it is very sweet, in this case with a serious brown sugar flavor. But it's so chewy, extremely well-balanced, and so long, that it's really something special. You usually want to drink big beers like this pretty close to room temperature to get the most flavor, but even cold out of the tap Old Yeller doesn't disappoint. To make this session more scientific, I headed over to the Green Dragon to see if they had a barleywine on tap. Turns out they had two of them, Mad River's John Barleycorn, and the classic American barleywine, Anchor's Old Foghorn. These were both strong, tasty, sweet brews, but tonight they lost out to Old Yeller. Neither of them had the complexity of malt flavor that Old Yeller had. I'd say the John Barleycorn was the more flavorful of the two, but the Old Foghorn was a smooth, very well done beer. That was also a trip down memory lane for me. There was a time when you could go into Austin's Dog and Duck pub on pint night, and they would pour you an imperial pint of Old Foghorn for $2. I'm not sure if it was only some of the bartenders that would do that for you, or if they decided whether a patron could handle it on a case-by-case basis, but I do know I wasn't the only poor slacker to take advantage of that largesse. It's nice to see that the pioneering done by Anchor long ago has inspired a new generation of brewers to come up with their own take on barleywines. On a final note, it's ironic that I'm writing for the barleywine session on the first Friday in February. The first Friday in March, there will be a Barleywine Festival at the Lucky Lab's Quimby Street location.